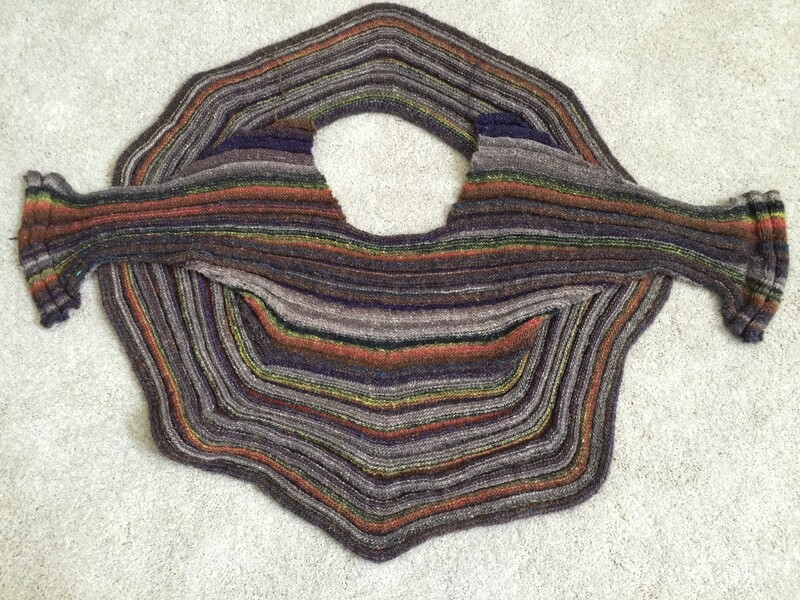 At the end of 2014, WEBS had a Year-end sale, and I scored 10 balls of Noro Silk Garden lite, Col. 2090. This happens to be the perfect amount of yarn to knit a Swirl, which I have always meant to do. This was my big chance, so I cast on, and this has been my designated personal project for the first half of 2015. I worked on it in movies, when between projects for work and classes, and when I was too tired to think and just wanted to knit something for fun. As knitting does, it progressed to completion, slowly but surely. It felt a bit like a mystery knit-a-long, despite having the book in front of me, because there were too many stitches on the needle to tell what is going on. It is knit in ridges called “welts”, which are numbered (there are 51 in my Forest Fiesta), and the welts have different numbers of rows in them. I made sure to keep track of what number welt I was on. This is important for this project, to prevent getting lost. This week I finished designing 3 new classes, and knitting the project samples for them. I definitely deserved time for some personal knitting, so I pulled out the Swirl. 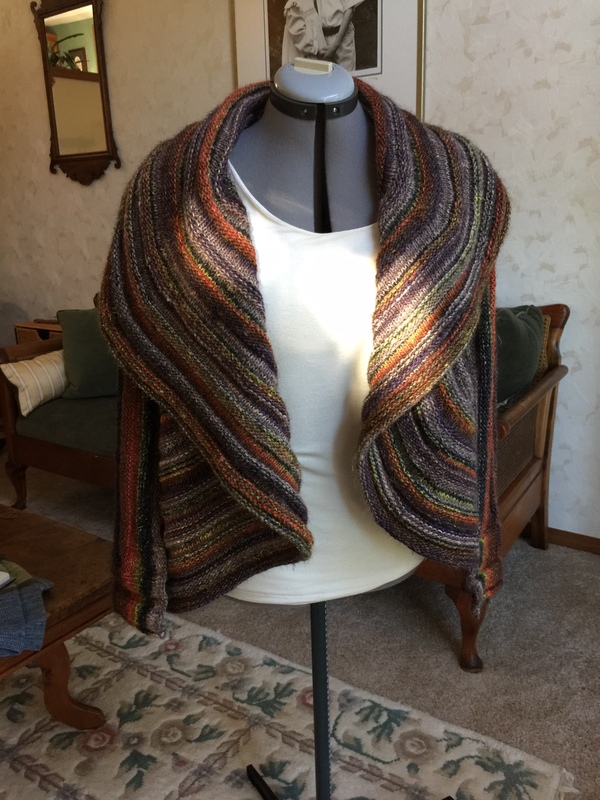 I was about halfway finished with the sleeves (knit at the same time) and decided that I could finish it on this go-round. The big lump of knitting was looking decidedly odd, and I couldn’t tell how it was going to come together. Finishing the sleeves and binding off didn’t help, much. 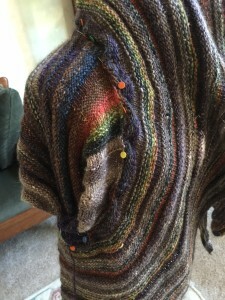 Here is the sweater, right off the needles. Hmm. A big circle with attached wings. Blocking didn’t help at all, it just looked like a smoother big circle… still with wings. I could not see how I was going to sew the sleeves into the big circle, to make a sweater. The book instructions, which was so clear throughout the knitting, seemed quite abrupt about the finishing, so I assumed it to be easier than it appeared to be. 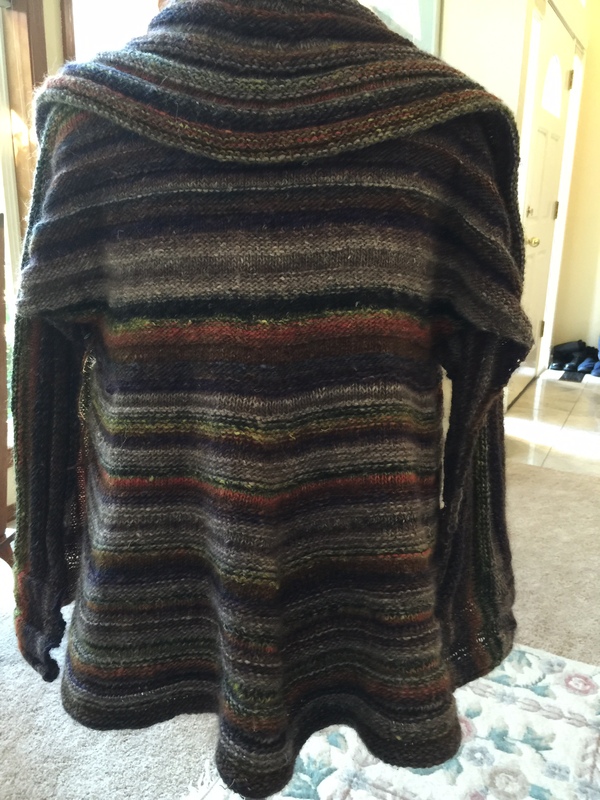 I pulled out Betsy, the mannequin, and started to arrange the knitted mass into something resembling a sweater. The mannequin form was a big help, and I found that putting the sleeves INSIDE the circle was key, as it got them out of the way. I pinned everything and saw how it might work, but the circle wasn’t centered on the back. Out came the pins and I tried again. Now, there is light at the end of the tunnel. I can see how this will be a sweater, and hey! It looks pretty good! Now I just have to mattress stitch the seams – that is on tap for tomorrow.